Paper straws are one of my favorite party details. 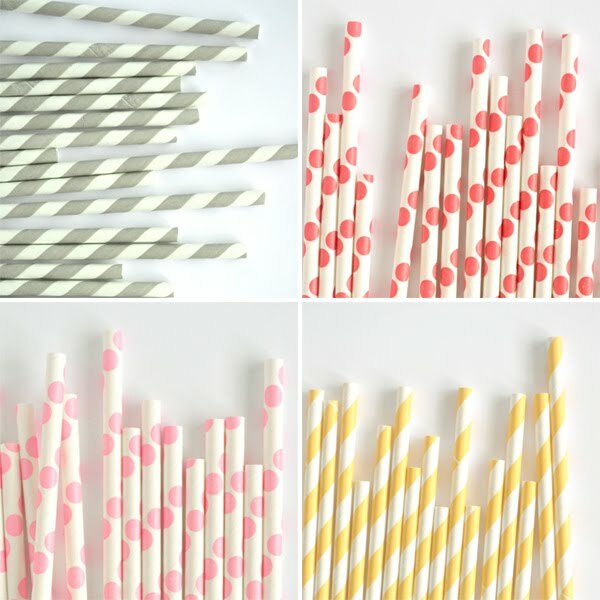 I like to drink from a straw even at home (using reusable ones), so I am loving these striped and spotted straws from emerald+ella. Don't you want to plan a party around them? I love these. They bring back fond childhood memories. My Mom would go crazy when I would chew on them! Ohhh yes. I have had these bookmarked and waiting for an opportunity to buy and use! SO much fun! so fun. i keep them in a glass jar in my kitchen after the party to brighten things up a bit! love the pink polka dotted straws! J'adore these! Esp the pink polka-dot ones. oh i love the polka dot once and i have to get me some of the twine too - so pretty! They can bring a touch of whimsy to any event...wedding, baby shower, or rehearsal dinner! :) How can you not love these? I do, I do want to plan a party around them! Ah, how sweet and pretty. Yay party straws! These are adorable. Those are soooo cute! Thanks for sharing, Alli! I've never seen the polka dot ones before, those are adorable! I ALWAYS use straws at home too. My husband always makes fun of me, but I say it's a great thing to be a kid at heart! I think I may need some stripey and polka ones too!